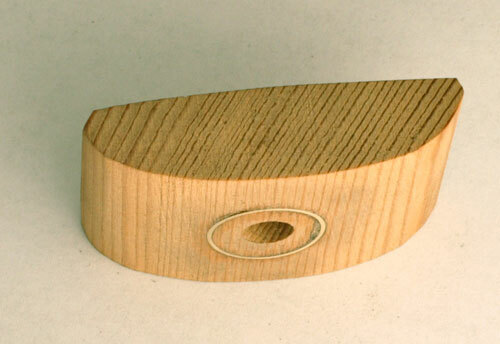 The Peg Ringer is a tool that repairs one of the most difficult breaks in a violin - the peg hole break. 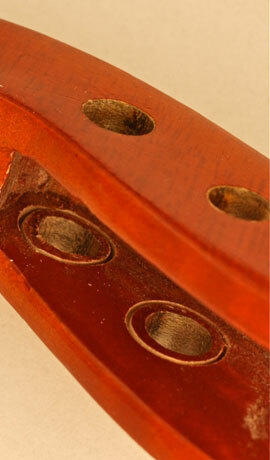 Most often seen on A-pegs in a violin; this repair typically requires significant wood replacement to obtain a reliable repair. 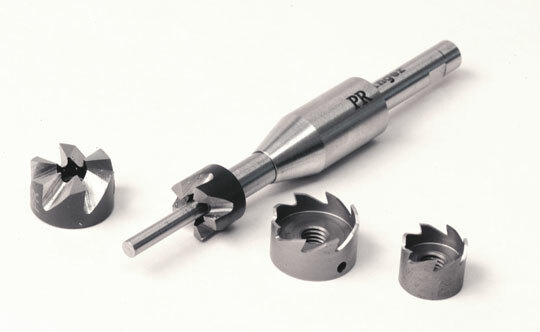 The tool itself consists of a steel shaft, a circular saw and two centering sleeves to allow milling the groove concentric to the peg hole. An initial set of stainless steel or carbon fiber rings is included. All parts are made from hardened tool steel. 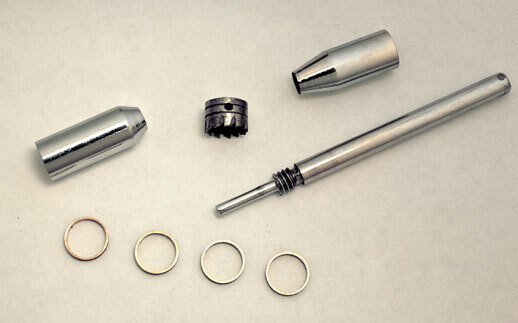 Replacement parts are also available for sale individually, as wear and tear require. Repair of peg hole cracks from inside the cheek. No wood needs to be replaced. 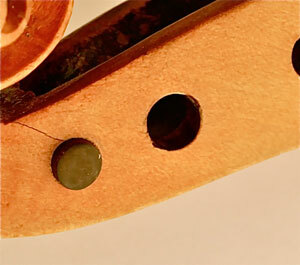 Preventing peg hole cracks in existing violins. The ring can be exposed or hidden. Inserting rings on both faces of the lower block to prevent splitting from button or endpin stress. The larger cello cutter is used for this application. Re-attachement of torn back tabs as a substitute for “bathtub” patches. Clean and glue crack and clamp firmly. Manually compress the centering sleeves on both sides of the shaft. Turn the shaft with an electric drill to mill a 2-3 millimeter deep groove on the inside of the peg cheek, concentric to the broken peg hole. Insert a metal or carbon fiber ring into the groove. Glue ring in place with a hard, permanent glue. Epoxy, Cyano acrilate and water-proof wood glues have been used. Use a wood filler to fill the groove level with the cheek and touch-up to blend with the background. Touch-up the outside crack area. We accept MasterCard, Visa and Discover Card in addition to check or money order drawn on a US Bank. You can also contact us through the website to any questions and support.